The goal of modern dentistry is to manage non-cavitated carious lesions non-invasively through remineralization in an attempt to prevent disease progression, and to improve strength, esthetics, and function of teeth. The emphasis currently is being given to new technologies for enamel remineralization which suggest the changes in the understanding of dental caries. The aim of this paper is to review the contemporary non-fluoridated systems available for remineralization therapy and ideas for their implementation into clinical practice. A search of articles from "Pubmed" and "Medline" with the keywords Remineralization-demineralization, Casein derivatives, Non-fluoridated remineralizing agents was conducted. A total of 526 abstracts were collected, out of which 172 articles that discussed current technologies of non-fluoridated remineralizing agents were read and 33 most relevant articles were included in this paper. Casein phosphopeptide based technology has been established as a strong non-fluoridated remineralizing agent fulfilling all the criteria of an ideal remineralizing material. Background: To assess the plaque and salivary pH changes at different time intervals in vivo after consumption of a carbonated beverage modified with sodium fluoride and calcium phosphate. Materials and Methods: Twenty-four subjects aged 18-25 years were recruited and randomly assigned to three groups (group A, original drink sprite; group B, sprite with sodium fluoride; group C, sprite with calcium phosphate). Collection of pooled plaque and unstimulated saliva was done before and after the drinks were consumed by the subjects at 5-, 10-, 20- and 30-minute intervals. 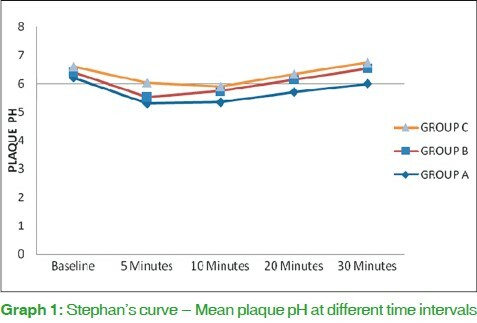 Results: The pH rise was higher with group C for plaque and group B for saliva. Conclusions: Modification of the test carbonated beverage with calcium phosphate and fluoride may exert some protective potential, especially in high caries risk candidates. Purpose: This in vitro study was conducted to find out the effect of retentive groove, sand blasting and cement type on the retentive strength of stainless steel crowns in primary second molars. Materials and Methods: Thirty-two extracted intact human maxillary and mandibular primary second molars were embedded in aluminum blocks utilizing autopolymerising acrylic resin. After tooth preparation, the 3M stainless steel crown was adjusted to the prepared tooth. Then weldable buccal tubes were welded on the buccal and lingual surfaces of each crown as an attachment for the testing machine. A full factorial design matrix for four factors (retentive groove placement on the tooth, cement type, sandblasting and primary second molar) at two levels each was developed and the study was conducted as dictated by the matrix. The lower and upper limits for each factor were without and with retentive groove placement on the tooth, GIC and RMGIC, without and with sandblasting of crown, maxillary and mandibular second primary molar. For those teeth for which the design matrix dictated groove placement, the retentive groove was placed on the middle third of the buccal surface of the tooth horizontally and for those crowns for which sandblasting of the crowns are to be done, sandblasting was done with aluminium oxide with a particle size of 250 mm. The crowns were luted with either GIC or RMGIC, as dictated by the design matrix. 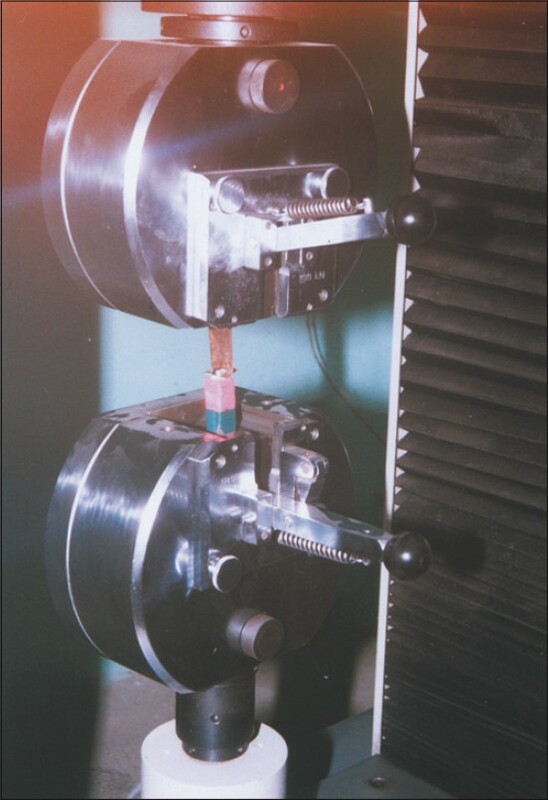 Then the retentive strength of each sample was evaluated by means of an universal testing machine. The obtained data was analyzed using ANOVA for statistical analysis of the data and 't'- tests for pairwise comparison. Results: The mean retentive strength in kg/cm 2 stainless steel crowns luted with RMGIC was 19.361 and the mean retentive strength of stainless steel crowns luted with GIC was 15.964 kg/cm 2 with a mean difference of 3.397 kg/cm 2 and was statistically significant. The mean retentive strength in kg/cm 2 of stainless steel crowns, which was not sandblasted, was 18.880 and which was sandblasted was 16.445 kg/cm 2 with a mean difference of 2.436 kg/cm 2 . These results were again statistically significant. Conclusion: It was found that the crowns luted with resin-modified glass ionomer cements (RMGIC's) offered better retentive strength of crowns than glass ionomer cements (GIC) and stainless steel crowns which were cemented without sandblasting showed higher mean retentive strength than with sandblasting of crowns. The presence of groove did not influence the retentive strength of stainless steel crowns. Backround: The oral mode of respiration cause postural adaptations of structures in the head and neck region producing the effect on the positional relationship of the jaws. 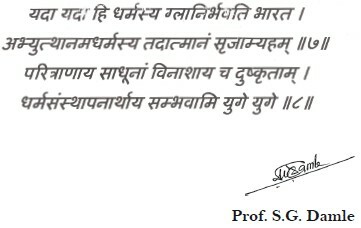 Aim: The aim of this study is to verify the skeletal relationship of mouth and nose breathing child. Study design: A cross sectional study was performed to assess the association of changed mode of respiration with dentofacial growth. Materials and Methods : One hundred children among which 54 were mouth breathers and 46 were nasal breathers of 6-12 years of age were submitted to clinical examination and cephalometric radiographical analysis. Statistical analysis : Chi-square test for proportions and independent sample's 't'test for parametric data is used. Result: The mean values of N-Me (P<0.001) ANS-Me (P<0.001) and SN-GoGn (P<0.001) for mouth breathers is significantly higher. ArGo-GoMe (P=0.003) and (P<0.011) for 6-9 and 9-12 years age group, respectively, were significantly low in nasal breathers group. Conclusions: Changed mode of respiration was associated with increased facial height, mandibular plane angle and gonial angle. Aim: The aim was to assess the characteristics and outcomes of infections affecting the structures of carious primary molars. Materials and Methods: Forty primary molars were used and classified according to the following clinical situation: With profound caries lesion, with bone loss at the furcation region, with perforation of the pulp chamber floor, and residual roots. The teeth were demineralized, cut, and stained with both haematoxylin-eosin and Brown and Brenn staining techniques. Assessment was performed using optical microscopy. Results: Statistical analysis of the data by means of the Chi-square test suggests that there was a significant relationship (P<0.001) between the intensity and localization of infection and the level of destruction of dental structures. A significant difference was also observed in the intensity and localization of infection between the groups regarding crown, furca, and root (P<0.001). Conclusion: More intense and profound the infection, more severe is the dental destruction. The groups of residual roots showed the most severe bacterial infection compared to other groups. Background: This study was done to compare and evaluate the compressive strength, diametral tensile strength, and microleakage of glass ionomer cement and chlorhexidine-modified glass ionomer cement. The glass ionomer cements used in the study were Fuji IX for group I and chlorhexidine-modified glass ionomer cement for group II. Materials and Methods: The strength characteristics (compressive and diametral tensile strengths) and microleakage of both the groups were evaluated after 24 h. Student's "t" test and Mann-Whitney test were used for statistical analysis of the difference in strength characteristics and microleakage. Results: There was no statistical difference (P>0.05) in the strength characteristics and microleakage of glass ionomer cement and chlorhexidine-modified glass ionomer cement. 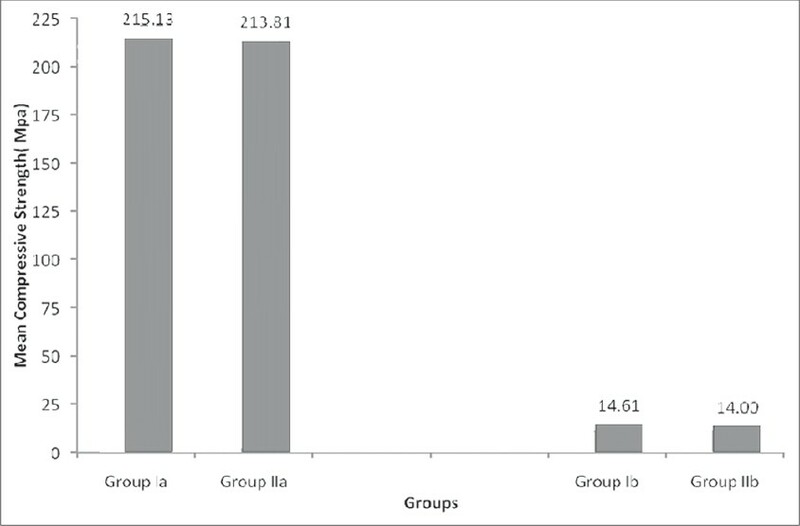 Conclusion: The present study suggests that strength characteristics and marginal sealing capability of chlorhexidine-modified glass ionomer cement were similar to those of glass ionomer cement (Fuji IX). So, chlorhexidine-modified glass ionomer can be considered as a substitute for glass ionomer cements, especially in pediatric dentistry. Objective: To find out the nature of feeding practices among children with cleft lip and palate. Materials and Methods: A total of 155 subjects of less than 2 years of age with cleft lip and palate were chosen and divided into three groups according to their chronological age. Group I included 47 subjects (M=35, F=12) who were <6 months old, Group II included 56 subjects (M=36, F=20) aged between 6 months and 1 year, and Group III included 52 subjects (M=28, F=24) of age between 1 and 2 years. Both the parents of the subjects with cleft lip and palate were interviewed and the details of the existing feeding practice were recorded on a standard proforma. Chi-square test was applied to find out any significant difference in the feeding method between males and females. Results: Spoon feeding was found as the most common feeding practice method. Breast feeding was the second most common feeding practice method among Group I subjects, whereas bottle feeding was the second most common feeding practice method among Group II and III subjects. The difference in the feeding practice between male and female subjects in all the three groups was very negligible and statistically not significant. Conclusion: Spoon feeding was found as the most common feeding method practiced by the parents of children with cleft lip and palate. 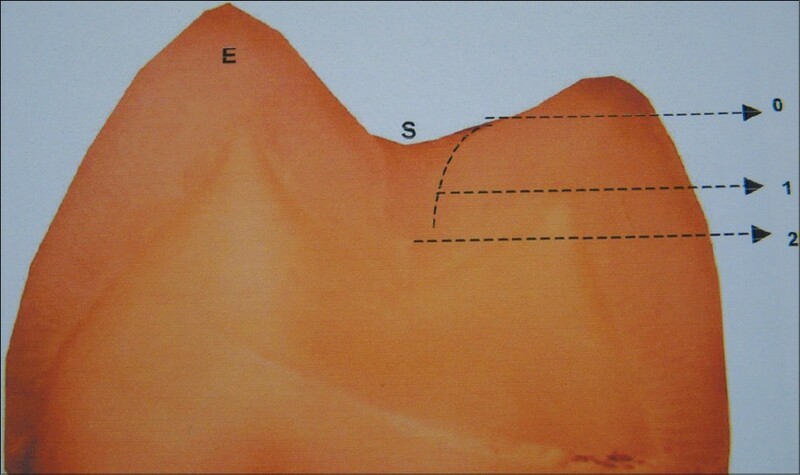 Aim & Objectives : The purpose of this in vitro study was to evaluate and compare the microleakage of pit and fissure sealants after using six different preparation techniques: (a) brush, (b) pumice slurry application, (c) bur, (d) air polishing, (e) air abrasion, and (f) longer etching time. Material & Method : The study was conducted on 60 caries-free first premolars extracted for orthodontic purpose. These teeth were randomly assigned to six groups of 10 teeth each. Teeth were prepared using one of six occlusal surface treatments prior to placement of Clinpro" 3M ESPE light-cured sealant. The teeth were thermocycled for 500 cycles and stored in 0.9% normal saline. Teeth were sealed apically and coated with nail varnish 1 mm from the margin and stained in 1% methylene blue for 24 hours. Each tooth was divided buccolingually parallel to the long axis of the tooth, yielding two sections per tooth for analysis. The surfaces were scored from 0 to 2 for the extent of microleakage. Statistical Analysis : Results obtained for microleakage were analyzed by using t-tests at sectional level and chi-square test and analysis of variance (ANOVA) at the group level. Results : The results of round bur group were significantly superior when compared to all other groups. The application of air polishing and air abrasion showed better results than pumice slurry, bristle brush, and longer etching time. Round bur group was the most successful cleaning and preparing technique. Air polishing and air abrasion produced significantly less microleakage than traditional pumice slurry, bristle brush, and longer etching time. Mucopolysaccharidoses (MPS) are a family of inherited metabolic diseases that results from the deficiency of lysosomal enzymes involved in the degradation of the glycosaminoglycans (mucopolysaccharides). 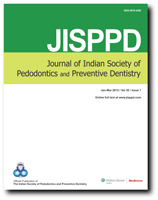 Despite the well-documented oral and dental findings of MPS type IV, there is not much literature documented about the incidence of this disorder among siblings in the same family. 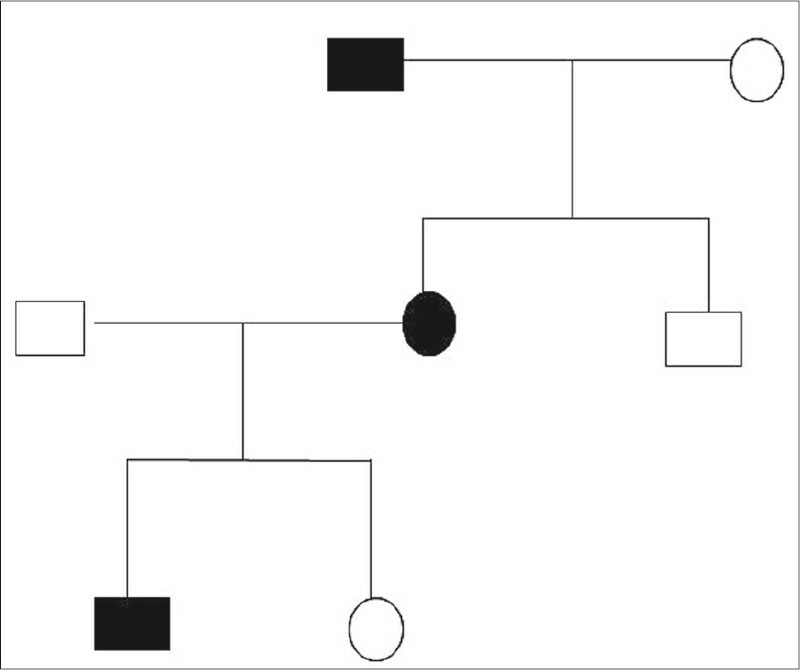 This report outlines the clinical and radiographic findings found in three siblings with Morquio syndrome. Defective enamel formation can be explained as defects occurring at the stages of enamel formation. Quantitative defects in matrix formation leads to hypoplastic form of amelogenesis imperfecta. Inadequate mineralization of matrix leads to hypocalcification and hypomaturation variants. The demarcation of matrix formation and mineralization is not so distinct. 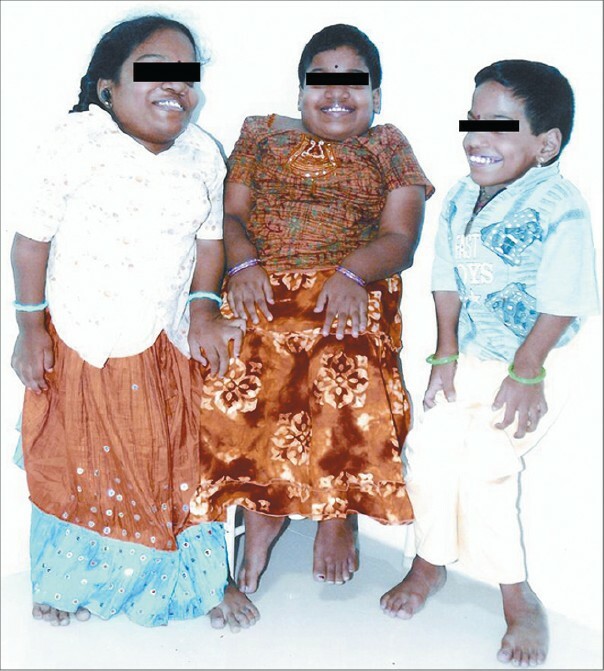 This paper describes a case of a 7-year-old boy with amelogenesis imperfecta - Type IA i.e., hypoplastic pitted autosomal dominant. Osteoma is a benign osteogenic tumor arising from the proliferation of cancellous or compact bone. The osteoma can be central, peripheral, or of an extraskeletal type. Peripheral type of osteoma is most common in the lower jaws, which occurs at the surface of the cortical bone and is sessile or pedicled. The overall incidence of osteoma is low, affecting 0.01-0.04% of the population; osteomas comprise 12.1% of benign bone tumors and 2.9% of all bone tumors. Most of the osteomas occurring in the mandible are dense osteomas, and the cancellous osteoma is comparatively rare. 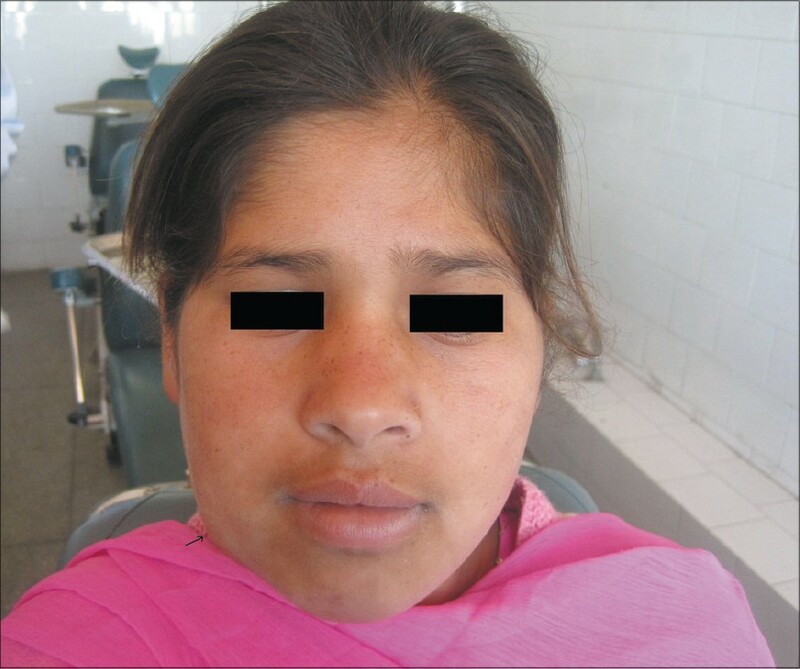 Maxillofacial osteoma associated with cutaneous sebaceous cysts, multiple supernumerary teeth, and colorectal polyposis is known as Gardener's syndrome. However, in some cases, maxillofacial osteomas with multiple impacted and supernumerary teeth are not accompanied by a fixed complex of symptoms. We report one such case in a 15-year-old female patient. Timing of orthodontic treatment, especially for children with developing class III malocclusions, has always been somewhat controversial, and definitive treatment tends to be delayed for severe class III cases. 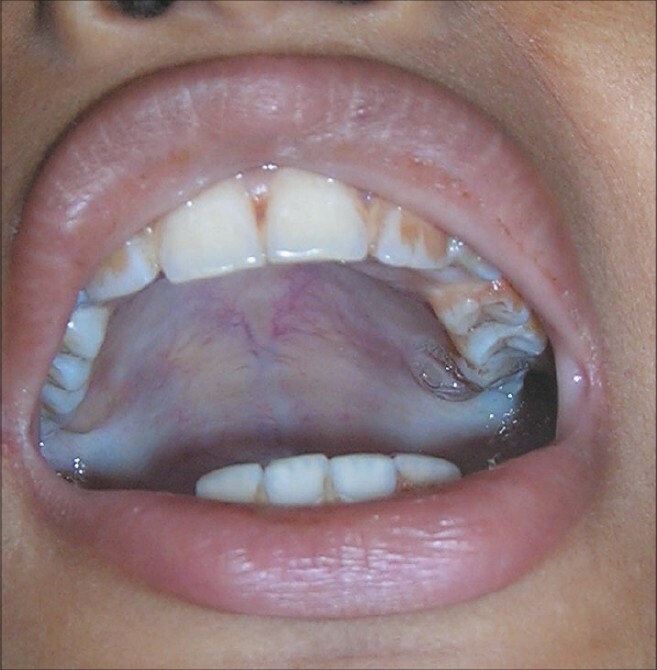 Developing class III patients with moderate to severe anterior crossbite and deep bite may need early intervention in some selected cases. 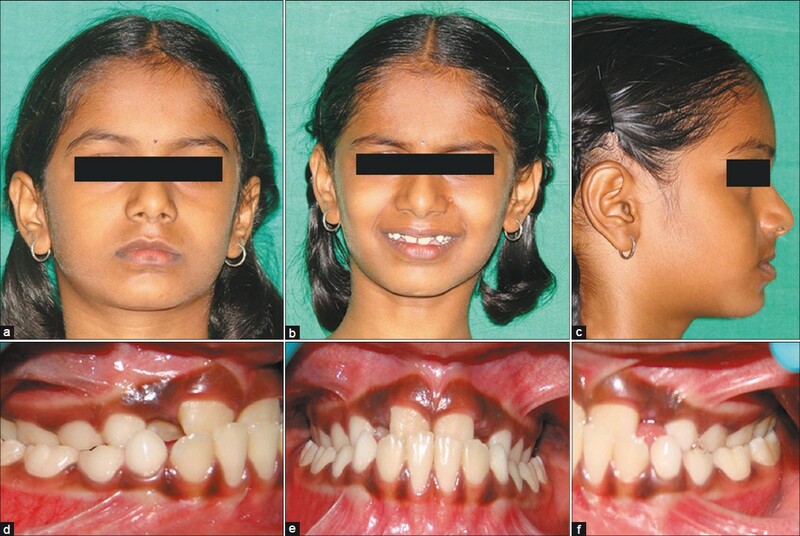 Class III malocclusion may develop in children as a result of an inherent growth abnormality, i.e. true class III malocclusion, or as a result of premature occlusal contacts causing forward functional shift of the mandible, which is known as pseudo class III malocclusion. These cases, if not treated at the initial stage of development, interfere with normal growth of the jaw bases and may result in severe facial deformities. The treatment should be carried out as early as possible for permitting normal growth of the skeletal bases. 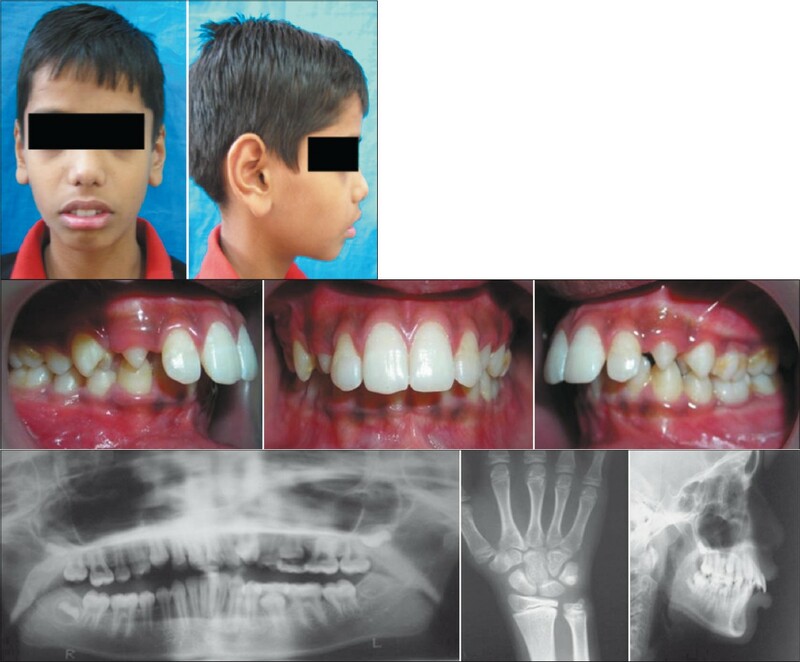 This paper deals with the selection of an appropriate appliance from the various current options available for early intervention in developing class III malocclusion through two case reports. Oral submucous fibrosis is a chronic debilitating disorder which is usually seen in adults with areca nut chewing habit. A rapid upsurge in the popularity of commercial areca nut products, especially among the younger generation, is a cause of grave concern, as satisfactory management is still lacking. Hereby, two pediatric cases of oral submucous fibrosis are reported.